If former Vice President Atiku Abubakar (or anybody the PDP presents as a presidential candidate) is the only alternative to President Muhammadu Buhari, then Buhari’s victory in 2019 will be a definite shoo-in, and that’s terrible for the future of Nigeria. As a political party, PDP is a hopelessly damaged brand. It’s too soon to forget the agonizing blight that the party inflicted on Nigeria. However hard one tries, it’s impossible to get past the insufferable arrogance, insensitivity, and impunity of the henchmen of PDP. To be sure, APC (which is actually old PDP wine in a new bottle) is continuing where PDP stopped. In fact, APC is a crueler, less transparent, and more sinister monster than its older PDP brother. That’s why presenting Nigerians with a choice between PDP and APC is a cruel Hobson’s choice; it’s like a choice between six and half a dozen, between evil and evil. Any selection or deflection of these two options would be a distinction without a difference. 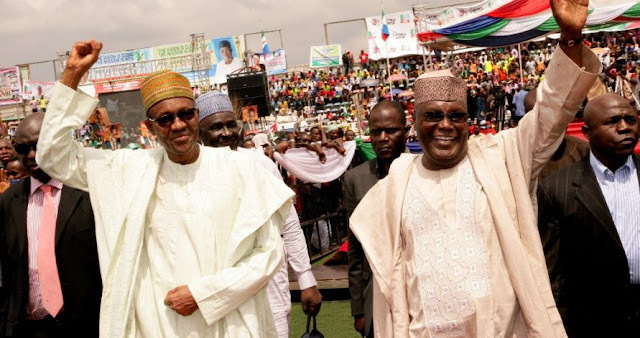 Like Buhari, Atiku has no new ideas, is barely educated, is deeply invested in the same retrograde politics of patronage that has held us back, disdains the poor (recall his boast about how his private secondary school students speak better English than UniZik students who are products of public schools? ), and is a classic, untrustworthy flip-flopper. When he wants to wrest power from southern politicians, he is a closed-minded northern chauvinist, but when his opponent is a northerner, he suddenly transmutes into an exhibitionistic nationalist who plays to the (southern) gallery. It reminds one of Buhari’s theatrical and faux nationalism in 2015 that saw him donning the symbolic ethnic attires of numerous Nigerian ethnicities, even going so far as to attend church functions, but we all know what he has turned out to be. If Nigeria must make progress, it must search for a future outside PDP and APC— and outside Buhari, Atiku, and all the familiar old stagers of Nigerian politics. But why hasn’t any transformational, forward-thinking, truly educated, and energetic non-career politician emerged yet as a presidential contender? Why is our country’s fate perpetually left in the hands of insouciant, doddering, uninspiring, incompetent, and provincial gerontocrats who have no earthly clue what it takes to govern a modern, multi-ethnic nation? As it stands now, if fractured and feuding PDP is the only alternative to Buhari’s APC, I can bet the farm that Buhari’s second term would be a blowout. I hope I am wrong because I doubt that Nigeria can survive four more years of Buhari’s dreadful ineptitude. Just like in 2015, the Southwest may determine the outcome of the 2019 election once again—if the election is free and fair, that is. As of now, Tinubu appears to control the intellectual and cultural elites of the region, who in turn influence public opinion in the region. Tinubu is alternately in the good graces of Buhari and silently pissed with him, and this is reflected in the endless vacillation between muted criticism of Buhari and visceral defense of him by Tinubu’s minions in the Lagos-based legacy news media and on social media. Tinubu’s mood swings toward Buhari dictate the pendulum of mainstream Southwest public opinion about him. This isn’t a dig at the southwest intellectual and cultural elites; it’s an acknowledgement of a reality, one that frankly unnerves me. Buhari is smart enough to know that Tinubu holds the key to his reelection, and has been careful to not alienate him—or to quickly retrace his steps when he inadvertently alienates him. He has practically handed the commanding heights of the economy to Tinubu and is banking on him to “deliver” the Southwest to him. If no one stops him, Buhari will win the majority of the Northwest, the plurality of the Northeast, and make a significant dent in the Northcentral, particularly in Nassarawa, Niger, Kwara, and Kogi states. That’s what I characterize as the “Muslim North.” He will certainly lose the Southeast and the South-south. But with two regions already in the bag, which he has always won handily, all he needs is the Southwest and a good chunk of the Northcentral. The lack of a viable alternative to Buhari and Atiku would make Tinubu’s campaign for Buhari in the Southwest a cinch. Given Buhari’s provable incompetence and undisguisedly subnationalist proclivities, which have plunged the nation to the nadir of fissiparity, allowing him to rule for another four years could sound the death knell for the country. This is no hyperbole. This is the time for a fresh, viable third force to emerge. I don’t know who that would be, but I know it wouldn’t and shouldn’t be the usual suspects; it must not be from the same cast of cancerous characters that have held sway in our polity these past 18 years. When I shared my preliminary thoughts on this on Facebook, several people challenged me to suggest names of people who might be considered as alternatives to Buhari, Atiku, Saraki and all the expected contenders, but I don’t want to get caught up in the web of petty squabbles about personalities. This is a challenge for all who give a thought to the future of Nigeria. People have talked about the outsized influence of money in politics and how this fact makes the emergence of the kind of presidential contender I am advocating impossible. I get that. But the election of Buhari has shown us that it’s possible for someone to win election in Nigeria on the strength of the notions of his “integrity” and “modesty of means.” This has turned out to be untrue of Buhari, but these were the most significant motive forces for his acceptance outside his traditional base. How about we try someone else? Off the top of my head, I can think of retired Colonel Dangiwa Umar widely acknowledged as just, fair, principled, hardworking, cosmopolitan, widely traveled, and well-educated. I’m not suggesting that he is perfect. He is not. No one is. It is our imperfections that make us human, but we all know what sorts of imperfections ruin nations and people. I don’t think anyone can accuse him of those sorts of imperfections—sloth, lethargy, corruption, clannishness, incompetence, indecisiveness, etc. He may decline to throw his hat in the ring. But there are many like him. I have no interest in partisan political contest. That's not my strength. I am only an observer of power. An English proverb says the onlookers, not the participants, see most of the game. Coaches and technical advisers are needed in games not because the coaches and technical advisers are better than the players (several coaches and technical advisers, in fact, don't have half the talent of players), but because the coaches and technical advisers have the benefit of technical knowledge and, most importantly, critical detachment from the field of play. I am by no means a coach of people in power, but my critical distance from the field of power play allows me to see what people ensconced in the easy chairs of power don't and probably can't see. And I am not alone in this.